In early 1995, Montreal avant-garde guitarist René Lussier flew to Vancouver, bringing with him drummer Pierre Tanguay, to meet with the NOW Orchestra. 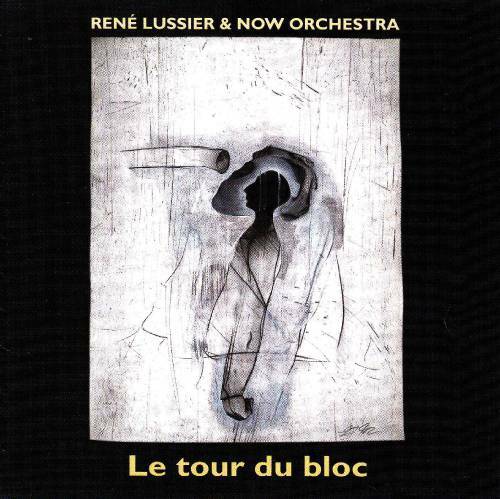 Recorded in the studio over two days, Le Tour du Bloc (Around the Block) is proof that the orchestra learned all of Lussier's tricks. This CD makes a great companion to the guitarist's previous album Le Corps de L'ouvrage, only expanding the sound palette, thanks to the 15-piece ensemble. The music is filled with stop-and-go signals, humorous circus-like licks, opposite melodies clashing into cacophony, and complex counterpuntal figures ending on ludicrous resolutions. "Première Course" and "Le Tour du Bloc" are typical fast-paced pieces, full of twists and turns. "Call Now" takes a more subtle form, developing nice contrasting motifs. "Y'a Rien de Facile" is a bombastic show closer defused by a long fade out.